I have been waiting and waiting for today. I actually feel like a kid in a candy store. Why? Because today I would like to introduce you to our newest Family Volley sponsor. 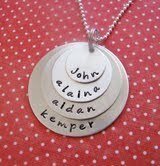 juliethefish designs makes hand stamped custom keepsakes. Specializing in jewelry as well as a wide variety of other gifts...bookmarks, wedding bouquet charms, baby spoons, guitar picks, key chains, etc. There is something for every occasion. Special care and attention is given to every piece. 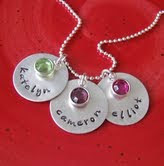 Julie can also work with you on any custom orders that interest you. Her prices are reasonable and she offers pieces of the highest quality. Julie lives in sunny California. She and her husband have two little boys. During the day she plays mom and at night she teaches English as a Second Language to Spanish speaking adults. She has always loved crafts. She has taken sewing classes, and loves to color, paint, and bead. 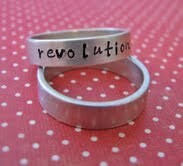 Her newest addiction is hand stamping sterling silver. 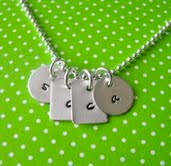 A few years ago one of her friends wore a simple necklace hand stamped with her son’s name. She loved it and thought, “Maybe I could make that.” That’s how the journey of her Etsy shop began. Now she spends late night hours hammering away while her loved ones sleep. 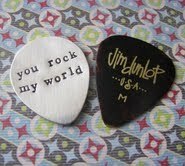 juliethefish designs makes hand stamped keepsakes for customers all over the world. "I am inspired by their lives, the stories they share, and their occasions for giving." I hope you will tell everyone you know about juliethefish. Give her all your support. a Gift Certificate for $35 dollars to her shop. You already know how you are going to spend that money, don't you? Do you want to win? Of course you do! Visit juliethefish designs and shop around. Leave me a comment telling me how you would spend your $35 dollars. Please leave your email address on all your entries. Leave a comment on another Family Volley post. Tweet or leave a post on Facebook about his giveaway. Be sure you include a link to this Family Volley post or it doesn't count. (This is worth 2 entries). Leave me a link so I can check it out. Giveaway will be open until Sunday night at 11:59 pm. Winner will be chosen using Random.org and announced on Monday July 5. Julie, welcome to the Family. such cute stuff....hard to decide. i love the 4 stacked name necklaces and the guitar pics the best. I love the custom beach babies necklace. Great store! I would LOVE the double oval necklace! So hard to choose....I really like the mama bird necklace. Oh, I'd have to get the engagement necklace! Of course I follow Family Volley. I love the teacher necklace. i love the "to the moon and back" necklace! I commented on the "Confession" twilight post. didn't realize you were on fb! I now "Like" you there too! 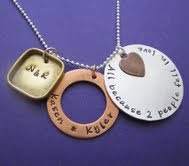 I love the family love necklace! I've commented on a couple of other posts. I love the handstamped silver flower and circle charm necklace. I would add a peacock blue fresh water pearl and add my kids' names to the charms. I voted and rated your blog, hopefully it worked because the site was acting funny. Oh I love the four layer silver necklace. So cute. I left a comment on another FV post! YES. I LOVE giveaways. And even better I LOVE these designs. I don't know if I can decide on what I want though, there's too many beautiful things! I love the layered ones with names though with the different shapes and sizes. And I follow the FV blog, I look forward to reading it all the time! I'm a FB fan of Family Volley! I'm a Family Volley fan on Facebook. I LOVE the Family Volley blog. It was so helpful for me to get some advice to deal with my illness with my kids. Cute stuff. I think I'd get the cube. I'm a private follower. Does that count? And I'm sure you're sick of all the comments I make on other posts. I love the birthstone drop earrings and the tiny round charm necklace. I'd get family initials and add charms as I add babies. Yay. I follow this blog. I love it! Thanks for being so consistent with fantastic ideas. I've left a few comments. You always comment back. That is another reason I love this blog! Ooo and do I get a second entry for the fb post? following jtf on her blog! 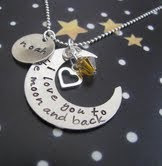 I love the to the moon and back necklace. I would get the birthstone drop earrings! I follow juliethefish designs on her blog!